Negative space. I don’t know what it is, and I don’t care to ever be in it. But the one man team at Hypersect obviously likes it, and he’s seen fit to use that space in order to create an entire video game – a video game that comes with both the very good, and a bit of the bad. 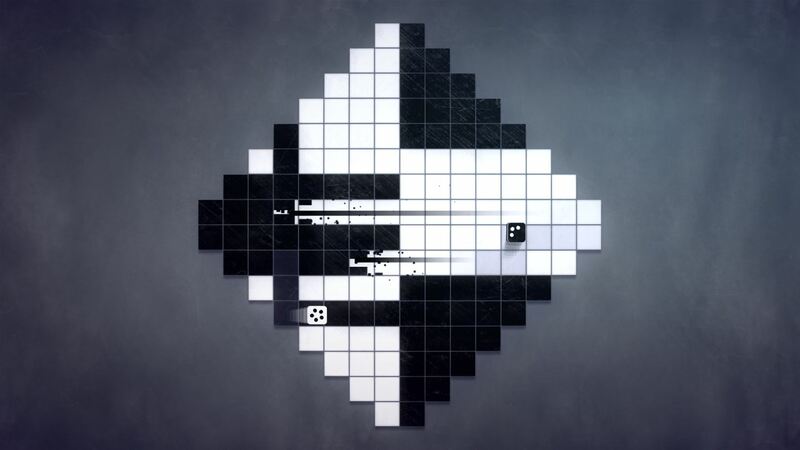 A negative space shooter, Inversus Deluxe caters for anything between one and four players, as you go about manoeuvring your small square into space, attempting to take down any on-comers as you do so. But it’s not as simple as you may think. 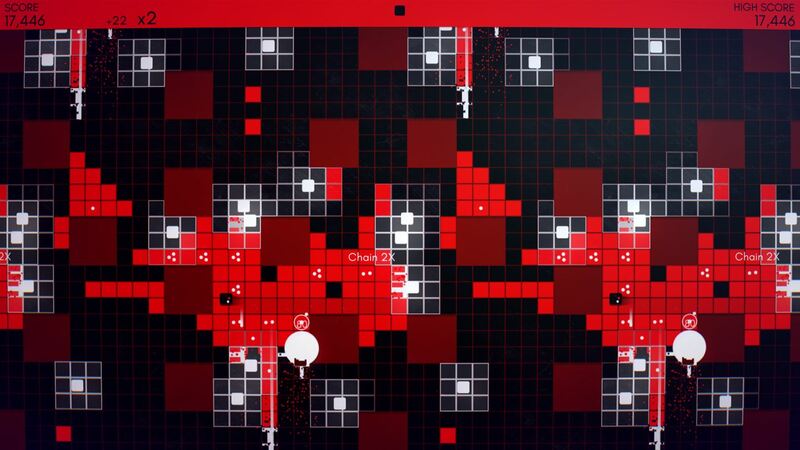 You see, player movement is constrained to opposite colours of a black and white grid, and it is only by shooting, which in turn flips the tiles to your colour as your bullet passes over them, will you be allowed to move about and destroy the enemy. Constant firing is frowned upon though, as your ship-like square only comes with five short sharp shots as standard. Yes they will replenish as you hold fire for a second, but with the action being hot and fast, sitting back and not shooting can be a disaster. Delivering one shot at a time isn’t the only way of making space and taking kills though, as holding down any of the face buttons (which determine your shot direction) will see a powerful three shot salvo being emitted, flipping multiple tiles and threatening even more foes. Thankfully with every kill you make, the enemy squares drop ‘ammo’, allowing you to swing over the square and see your shooting powers magically restored. You’ll therefore never be able to sit and hold in one spot, instead needing to shoot to move, shoot to kill and shoot to survive in and amongst the many enemy waves. Occasionally you’ll find super special extra-powered ammo shots, which fire at a faster speed and come with a bigger blast. You shouldn’t turn these down! With constant firing from all angles, walls and paths are created on the fly, before being removed again in a split second by any opponent. That in itself ensures nearly every game of Inversus Deluxe will be entirely different to the last, with your skills and reflexes needing to be on point at all times. 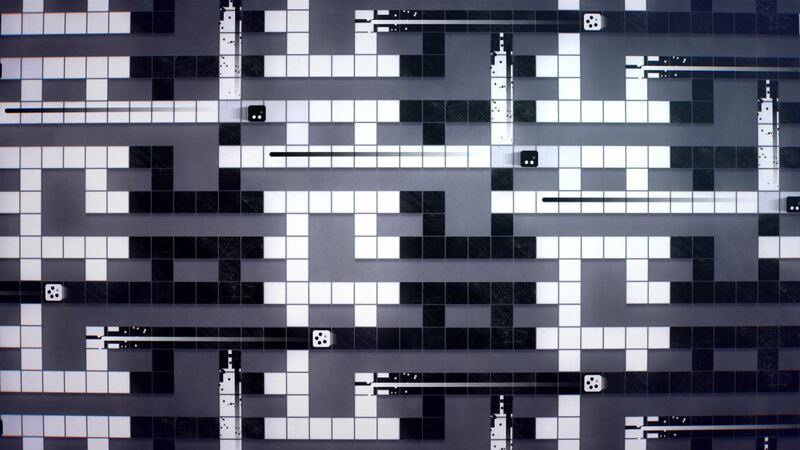 But whilst the basic mechanics of the game are the same however you play, completely separate game modes further enhance the variation allowed in the Inversus world. But unfortunately whilst the included Arcade mode is brilliantly quick, super-taxing fun, the Versus mode which should really be the stand out option fails to ever deliver. Starting with the good, and Arcade mode sees you, and a friend if you so wish, given the chance to go up against waves of enemies, taking them down in order to score points, which in turn will see further, more complex levels unlocked. No matter whether you’re alone or with others, it’s frantic fun, super tense and addictive enough to have you going back for more time and time again… if only because the draw of checking out that next map is a huge one. Score collecting is the name of the game, and with each of the different maps coming with their own unique points tally, providing you with the stars which unlock levels, just as you think you have got to grips with a certain stage, you will find that the next mixes things up once more. Gameplay is smooth and refined and even though there is a lot going on with lasers, blocks, enemies and yourself all constantly on the move, there is very little sign of lag or stutter. In fact, after a good few hours ploughing through things, I’ve only actually seen one slight hiccup where everything froze for a second. Even with local friends alongside you, that smoothness stays in place, allowing great opportunities for teamwork as you battle the fast, the slow, the armoured and the aggressive A.I. squares. It would be great if the same could be said of when you take the Arcade mode online too, but whilst the gameplay is still relatively smooth, constant network errors and the freezing of play hit home far too often. This normally sees you being chucked back to the main menu, ending your game and ensuring you lose the company of your precious online friends. That in itself is infuriating to see, especially when you have worked well together and are on the verge of a personal best score. So you may remember me mentioning the fact that Inversus Deluxe comes with multiple game modes, and both local and online multiplayer support. After the joy that the Arcade mode has brought this single player, you would therefore think any further additions would be a good thing. But if I’m being totally honest, I feel that this is where Inversus Deluxe comes a bit of a cropper. You see, a Versus mode in Inversus should really be the optimum game mode, especially if you take the name into account. But in reality, it falls somewhat short. The online player base is non-existent, unless you’ve got a friend at hand, leaving you struggling to ever find a match, but at the same time, the actual gameplay found within isn’t ever as exciting or thrilling as the joy that Arcade mode brings either. In fact, it’s all a bit slow and far too tactical for my liking, as player vs player gameplay sees one or the other sitting and hiding, before unleashing a triple shot blow in the hope that it hits. If it doesn’t, then nine times out of ten they’ll be left to retreat to a safe spot before rinsing and repeating. It’s all like a mindnumbing game of cat and mouse, and is something which I could happily do without. 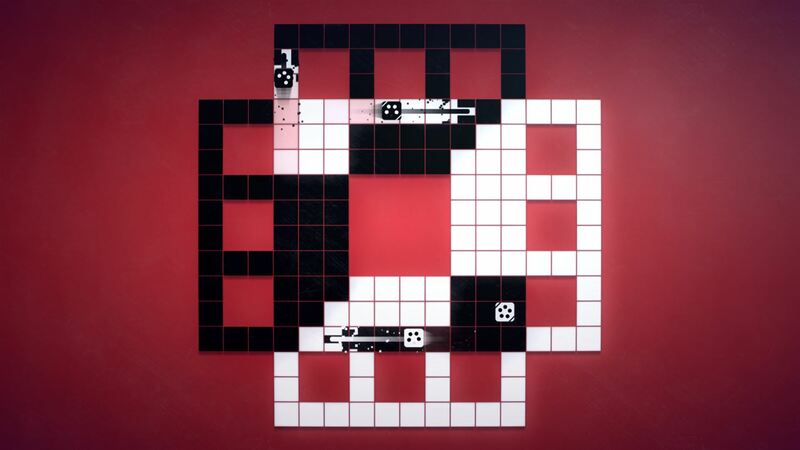 Granted, if you have friends round and wish to earn some bragging rights, then it does the job – and you won’t then have to worry about the online bugs – but at no point will you see Inversus Deluxe placed on the rotating list of party games that every gamer should have for those times of need. Other than the great audio, what I do very much like about Inversus Deluxe is the fact that every single thing you do in game counts towards your XP. This works to see you building experience levels, which in turn unlock a few lovely little extras. 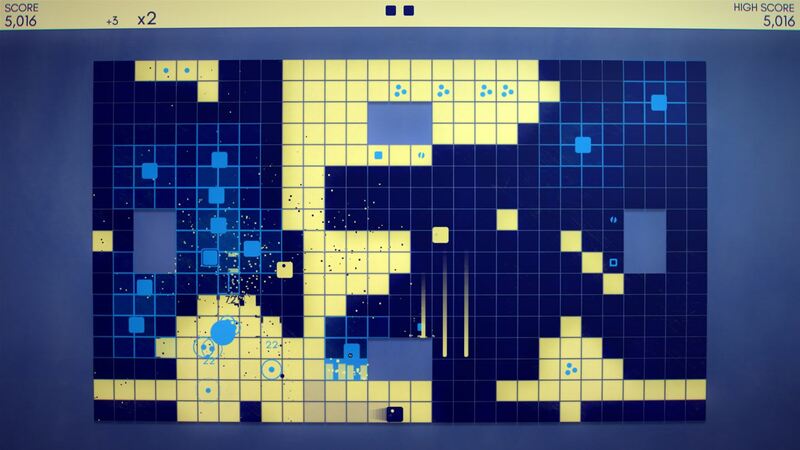 Normally you wouldn’t see me waxing lyrical about new colour palettes or ship trails, but in the case of Inversus the full range of colour designs are nothing but awesome. Yes, a few of them are retina burning affairs that should never have been put together, but the vast majority of the unlockable stage colour palettes are great to look at. Similarly the small, simple addition of adding a visual trail behind your ship as you move is something that shouldn’t make an ounce of difference to your game. But it does, and it gives you something else to unlock. Unfortunately I can’t say the same for the included Emotes. I understand the reason they have been put in – bragging rights and fun – but in practice they really are utterly pointless and I’d happily not to have to bother with them. 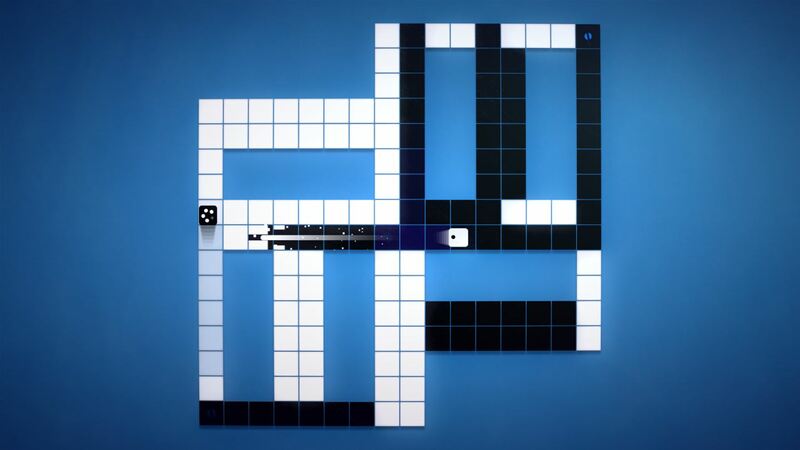 But don’t let the Emotes put you off because Inversus Deluxe is a hugely enjoyable game. Or at least half of it is because whilst I adore Arcade mode, the XP system and the multiple maps that the game comes with, the Versus option is lacking the fun factor. You also shouldn’t be buying it on the back of an online offering, because that is either bereft of players or full of network errors. Should you be a solo gamer, or regularly have local sofa-based mates who like to go high score hunting, then you should be lapping up the fun that Inversus Deluxe brings. Negative space is a thing. And it can be pretty good too. Sometimes.